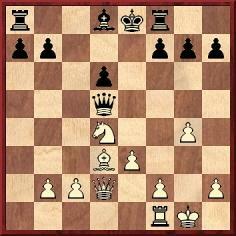 What is a Chess Combination? 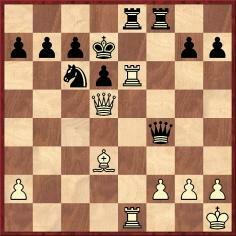 White, to play, wins by 1 Bb5+ Ke7 2 Nf5+ Ke6 3 Nxg7+, etc. He has made no sacrifices but ‘a succession of threats winding up with the capture of the netted piece’. See page 201 of C.J.S. 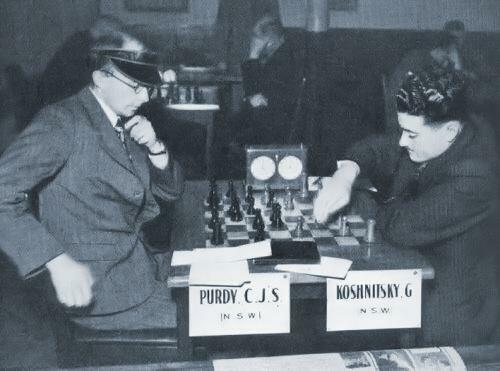 Purdy: His Life, His Games and His Writings by J. Hammond and R. Jamieson (Melbourne, 1982). Other illustrative positions would be welcome. Do readers agree with Purdy that ‘Combinations are characterized by violent moves, but not necessarily sacrifices’? 30 Qc8 Qd7 31 Re1+ Qe6 32 Rxe6+ fxe6 33 f7+ Resigns. Taking the example of a 1932 Spielmann v Stoltz game, C.N. 2035 (see pages 208-209 of Kings, Commoners and Knaves) asked whether the definition of ‘combination’ should cover combinative hallucinations. Publishing the next game on pages 280-281 of its September 1905 issue, the Deutsche Schachzeitung described the finish as ‘an original nine-move combination winning the enemy queen’. 21 Rxe8 Rxe8 22 Bf5+ Kd8 23 Rxe8+ Kxe8 24 Qg8+ Ke7 25 Qxg7+ Ke8 26 Qg8+ Ke7 27 Qe6+ Kf8 28 Qf6+ Resigns. When was ‘combination’ first used as a chess term, and in which language? Information on the exact issue and page number of Era would be appreciated, since we have only a reprint of the column in an 1858 US newspaper. ‘Combination’ was also used by Löwenthal when annotating the Morphy v Baucher game on page 185 of his book Morphy’s Games of Chess (London, 1860), but how much further back can the term be traced, in any language? ‘A forcing manoeuvre which is based on certain strategic contradictions is called a combination. This term is very often confused with sacrifice, but this is wrong for two reasons. Firstly, because the strategic contradiction which is the basis of every combination does not necessarily involve the sacrifice of material. 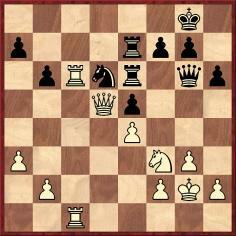 The side carrying out a manoeuvre may accept a certain positional disadvantage such as a weak pawn, the exchange of a well-placed piece, an exposed king, etc. These and similar freely accepted positional disadvantages are of course just as much strategic contradictions. During the rest of the manoeuvre the active side reaches a position which is more advantageous than the original one, and this again is the hallmark of a combination, although sacrifice does not come into it. 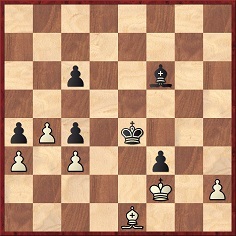 ‘A “combination” is a manoeuvre obtaining for the player who executes it – and without the adversary having any effective defence if the combination is sound – a certain advantage such as the gain of material (a pawn, the exchange, a piece), a mating attack, improvement of the position, and finally (in the case of starting from an inferior position) a draw by stalemate, perpetual check, or reduction of force below mating strength. 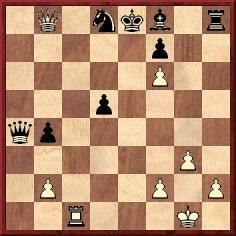 Source: The Art of Chess by James Mason (London, 1898), page xi. Source: Challenge To Chessplayers by Fred Reinfeld (Philadelphia, 1947), page 21. As shown above, the ‘common object’ idea was mentioned by James Mason on page xi of The Art of Chess (London, 1898). 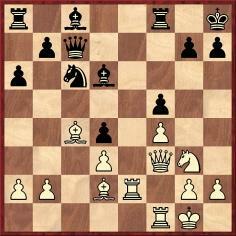 52...Bh4+ 53 Kf1 Bxe1 54 Kxe1 Kd3 55 h4 Kxc3 56 h5 Kb3 57 h6 c3 58 h7 c2 59 Kd2 f2 60 h8(Q) c1(Q)+ 61 Kxc1 f1(Q)+ 62 Kd2 Qf2+ 63 Kd3 Qc2+ 64 Ke3 Qc3+ 65 Qxc3+ Kxc3 66 Ke4 Kb3 67 Kd4 Kxa3 68 Kc3 Ka2 69 Kc2 a3 70 Kc1 Kb3 71 White resigns. Chernev then listed six stages in ‘the series of ideas’. Concerning this remark by Fred Reinfeld about Pilnik v Najdorf, Mar del Plata, 24 March 1942 on page 202 of Great Brilliancy Prize Games of the Chess Masters (New York, 1961), see C.N. 11192. Latest update: 21 January 2019. To the Chess Notes main page. To the Archives for other feature articles.